Before you get dressed you can give a stylish pose by holding your wedding dress. The poses like wedding dress hanging on the wall, wedding dress on the bed while you are looking at it with a cute smile, carrying wedding dress in the arms and photo taken from any side of you that focus in the wedding dress in your arms etc are some good bridal photo-shoot ideas. Wedding dress brings the best feeling to a wedding. These shoots can only be done by your candid photographer in kanpur if you give him proper time before getting ready So try these bridal photo-shoot ideas. The alluring wedding ornaments can be used to take some amazing photographs. If there is any beautiful lanterns or anything like that put any ornament around to capture some photos. Or arrange the ornaments beautifully above a table or box to capture its images. Getting ready means the transformation of a girl into a bride. This will be a touching moment for everyone including the bride. 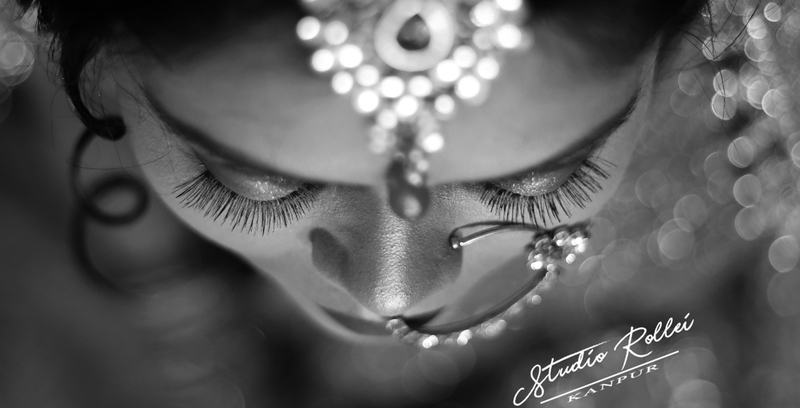 You can capture shots like beautician applying makeup in the face of the bride, bride wearing bangles and earrings facing the mirror, hair styling etc are some bridal photo-shoot ideas. If some pictures are taken in black and white photography it will be more beautiful. The photographs of showing sandals on the feet are also good. Most of the Indian bride pore Mehndi on their hands. But some religions don’t have this custom. If your bride has Mehndi in her hand then don’t skip taking some beautiful photos of it. Showing Mehndi hands to the camera, photo-shoot from the side of the bride focusing the Mehndi hands etc can be captured. Today everybody loves to take the selfie. why not the bride? Let her take some selfies of her in the wedding dress. The wedding photographer in kanpur can easily capture this selfie moment of the bride. Let her friends and family join with her and have a selfie photo shoot. Let the bride have some fun with the trees and plants in the garden in the home or nearby area. Nature is so beautiful and it adds more alluring looks to the bride. Let her simply wave her wedding dress in the rhythm of winds. Or you can take pictures like the bride sitting in the grass, gently touching the flowers and plants etc. The properties like beautiful umbrella, lanterns can be used to capture some amazing images. Let her simply hold the lantern and tell her to look into the camera. Holding umbrella, covering her face by the umbrella, sitting in the grass with lanterns, the face of the bride in small mirror etc can be converted into beautiful shots. Let the bride look into something far away or just a look to a long distance. 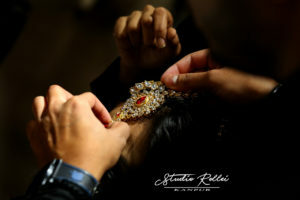 The wedding photographer in kanpur can capture the images of this from the back side of the bride or on her other sides. The family is the best part of everyone. Photographs with family members give a special feeling, especially for the bride. Because after marriage, the little girl of the parents will go to a new home as a newly wedded one. So these photographs are really important and create happiness around the bride. Everyone will be so excited to have a look at the bride while she enters the wedding spot especially the groom. That moment gives lots of happiness to everyone. When the bride enters the spot she definitely looks for her groom and her eyes will strike at the groom’s face. Never miss this beautiful moment. The candid wedding photographer in kanpur will get that cute smile with lots of excitement and hope in bride’s face. ← Are Low cost wedding Photographers really Bad?